We need to be grace people and truth people. Not half grace and half truth. Not all grace on Mondays and all truth on Tuesdays. All grace and all truth all the time. When I was being interviewed to be the pastor at University Reformed Church, I had to indicate where I was on a spectrum of issues. One of the lines measured grace versus truth. I wrote something like: “This is a bad question. Seeing as how Jesus came from the Father full of grace and truth, I believe we should be 100% in both directions.” I think they knew it was a loaded question and wanted to see my response. By personality and upbringing and a whole bunch of other factors most of us lean in one direction or the other. Grace people are pleasant to be around. They don’t ruffle any feathers. They cut us a lot of slack. They’re easy going. They accept us for who we are. They don’t make demands. They are always welcoming. 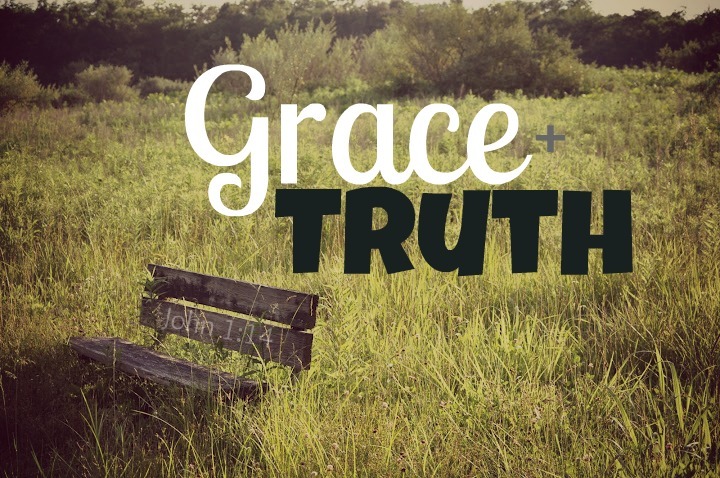 But without truth, grace isn’t really grace, it’s just being accepting and nice. But affirmation and being grace-filled are not the same thing. Grace people without truth are pleasant to be around, but we wonder if they really like us or if they are just trying to be liked. They are tolerant, but they often do not know the difference between right and wrong. Or they don’t care to line up one way or the other. Grace people can be cowardly. They often refuse to make tough decisions in life. They demand nothing from others and get nothing in return. They accept us for who we are, but they never help us become who we should be. And then there are truth people. Truth people are easy to admire. They have convictions and principles. They believe in right and wrong. They set standards. They speak out against injustice, oppression, and evil. They are articulate and well-spoken. But without grace, telling the truth can become an excuse for belligerence. Truth people without grace are loyal to their cause, but we wonder if they are really loyal to us. They want to change us and make us better, but they don’t allow for mistakes. They are quick to cast judgment on others. They make difficult decisions, but they also make life difficult for others and for themselves. They can be slow to forgive. They inspire us with their courage, but turn us off with their intimidation. If you are a grace person you are most concerned about being loved. If you are a truth person you are most concerned about being right even it means being unloved. Both have their dangers. Something is wrong if everyone hates you, and something is probably just as wrong if if everyone loves you. Jesus was all grace. He welcomed sinners and tax collectors and ate with them. He had compassion on the crowds when they were hungry and far from home. He welcomed the little children to come and sit on his lap-gentler and kinder than any department store Santa. He healed the lepers, the lame, and the blind. He saved the criminal on the cross, who, in his dying breath, confessed that the dying man next to him was truly the Son of God. And Jesus was all truth. He condemned many of the religious leaders of his day for being liars and hypocrites. He talked about hell more than he talked about heaven. He called all his those who would be his disciples to take up their cross daily and follow him. He prophesied judgment on Jerusalem for their unrepentant hearts. He obeyed the law, set standards, and demanded everything from his followers, even their very lives. Jesus came from the Father full of grace and truth. All grace, all truth, all the time. But he didn’t come simply to give us an example of grace and truth. He came to save us in grace and truth. It’s only after we’ve been saved and made right with God, the God says, “Alright, now that I have saved through Jesus, you need to know that I have saved you to look like Jesus.” The motivation to be full of grace and truth is not because we need to earn God’s favor, but because being a follower of Jesus Christ, means we look like the one we follow. We desperately need grace in our lives. We need to hear from Jesus “Come to me, all you who are weary and heavy-laden and I will give you rest” (Matt. 11:28) We need to know that God doesn’t expect us to clean up our act before we come to him. He implores us to come, now, today, just as we are–in brokenness, in pain, in humility, in repentance, and in faith. We need to hear that wayward children, who have squandered their inheritance and lived an immoral, rebellious life, can come home into the arms of their heavenly Father (Luke 15:20). And we desperately need truth in our lives. We need to hear from Jesus “the truth will set you free” (John 8:32). And we need to hear from Jesus what this saying really means: “I tell you the truth, everyone who sins is a slave to sin…But if the Son sets you free you will be free indeed” (John 8:36). We need someone as gracious as Jesus to tell us the truth: you are not okay. You do not need to push away those feelings of guilt that weigh you down. You are guilty. And anyone who tells you otherwise, is not telling you the truth. And because they won’t tell you the truth, you won’t experience the grace you need. We need truth. We need grace. We need Jesus. Only Jesus Christ lived in perfect grace and perfect truth. Only Jesus Christ can save hard-hearted, hard-headed sinners full of lies and deserving judgment. And only by union with Jesus Christ, can we grow in the same truth and grace that walked among us in the miracle of the incarnation. There is so much grace and truth in this article by Kevin DeYoung, I felt I had to pass it on. Can opposite characteristics cohabit in the same body? Read on to find the answer. Excellent discussion of grace and truth. This is a message that bears repeating, hence I re-blogged it. Great – it’s a message that needs to be heard and heeded!